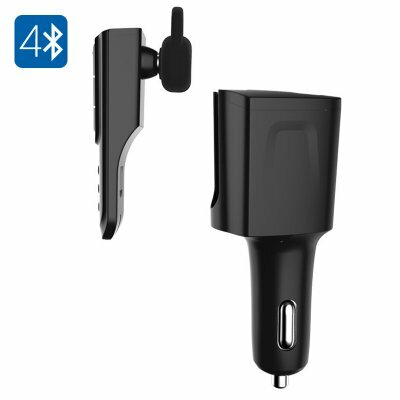 Successfully Added Portable Bluetooth Headset + Car Charger - Bluetooth 4.0, Handsfree, Supports 2 Bluetooth Devices Simultaneously to your Shopping Cart. Drive to the sound of cool tunes, pick up calls handsfree and charge your phone while you’re at it! With the wireless Bluetooth headset + charger, you have yourself a nice 2 in 1 gadget and a must-have car accessory. When you are in small space – like a car – you need gadgets and accessories that are compact and functional. That’s why, when there is a chance to have two problems solved with one device for your vehicle, there is every reason to go for it! This portable car charger comes with a convenient and smart addition – it doubles as a handsfree Bluetooth headset, so that you can listen to your favorite tracks and charge your gadgets while driving. Coming with Bluetooth 4.0, it will efficiently sync with you devices and even support simultaneous connection to two Bluetooth devices. So, you can connect the headset to your MP3 and phone at the same time and enjoy your music without worrying about missing an important call. The USB charging port provides fast and efficient charging for your gadgets, so that your can always recharge your small electronics in the car. Light, compact, instantly ready-to-use and compatible with any standard car charging slot, this 2-in-1 car accessory is great and inexpensive addition to any vehicle. The headset comes with a 50mAh battery and will offer you up to 3 hours of non-stop talking time. The Portable Bluetooth Headset + Car Charger comes with a 12 months warranty, brought to you by the leader in electronic devices as well as wholesale car chargers..